After a decade of extreme experience in the moving, construction and demolition industry, the RUBBISH INC™ Demolition Crew is made up of the BEST, equipped to quickly and easily handle any of your residential demolition needs at an affordable price. Whether you are looking to have a wall or two knocked out, or the entire house! We’re the crew to call! 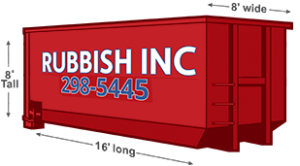 Our work ethic coupled with our strong emphasis on customer service makes the RUBBISH INC™ Demolition Crew one of the best demo and junk removal service providers in the Austin area. We aim to meet and exceed your expectations from the minute we come on the job to the minute we leave. And the best part of our service, we have all the trucks, trailers, and big toys needed to get the job done. We are here to both help and guide you every step of the way. Contrary to our competitors, no matter the job size, we are always willing to swing by for a free estimate and consultation and if necessary, prepare a demo plan that is laid out in an easy to understand format with pictures and explanations. You deserve this kind of attention and our design team is readily prepared. We would like to think of our demolition approach as flexible and dynamic, with a strong emphasis on safety. Through integrity and hard work, we are true to our name and continue to bring the highest quality of service and personal attention to the city of Austin. Every job is different and so are the needs of our clients. By maintaining a tight knit management team packed with an array of experience, we are able to maintain close relations with our clients and actively adapt to their requests and needs. Please feel free to contact our management staff at anytime. At Rubbish Pod it is Always Safety First! The RUBBISH INC™ Demolition Crew maintains a full time commitment to both OSHA and in-house safety precautions at all times. And for your protection, as well as ours, Rubbish Inc is insured and covered by a multi-million dollar insurance plan. Call Now to Set up a Time for Us to Come Out and Discuss Your Needs.